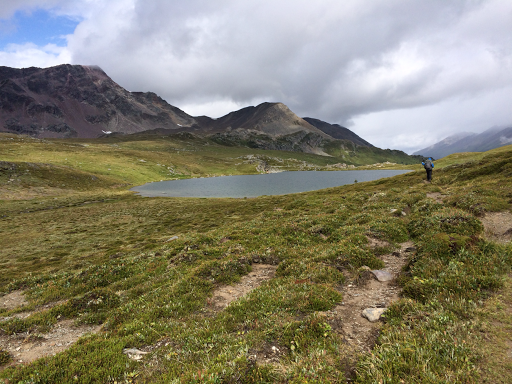 No elevation chart was available for today…it was fairly flat. Today was the one year anniversary of the completion of my Appalachian Trail hike. I wondered why I hadn’t remembered any of my completion dates while on a trail and realized it’s because I’ve always finished trails earlier each year…so I haven’t been on trail for a completion trailaversary. The funny thing is that today had many things that were similar to hiking along the AT. First off, it rained on and off thru the night from 1:30am-5:30am. Thankfully, it stopped long enough for us to pack up and leave by 6:30am. 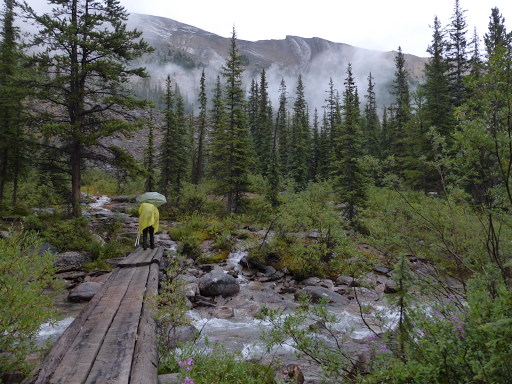 The early morning was forested hiking in dense woods with many wooden bridges over streams. It pretty much rained on and off all day and it seemed that 50% of the day was in rain…it was probably less, but sure seemed like half the day. With all the brush and the returning rain, rain gear was kept on all day with temps in the mid 40sF/7sC. 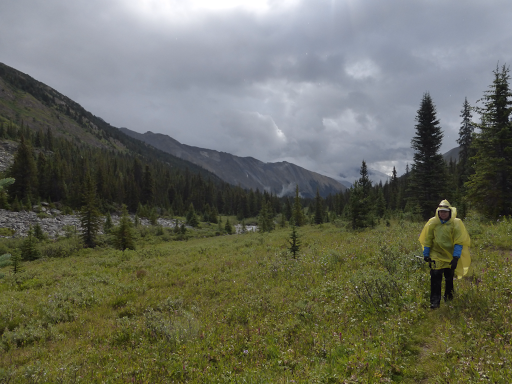 At one point, we joined a decommissioned trail for the rest of the day called the Maligne Pass trail. 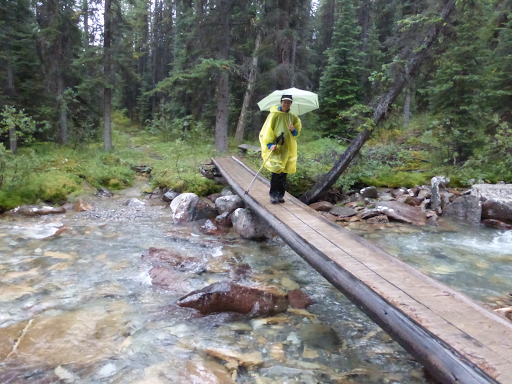 It is no longer included on the current Jasper National Park maps and there is not regular maintenance on it. 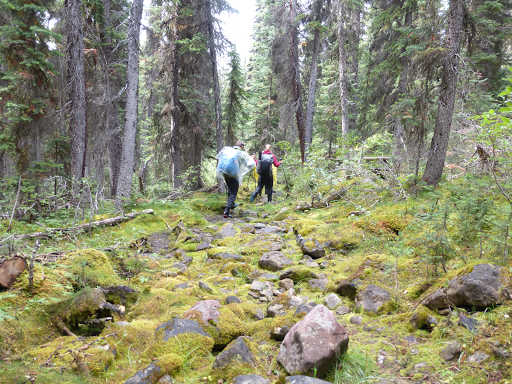 The reports from previous years hikers vary quite a bit, but what we knew to expect was slower terrain, overgrown trail, bogs, stream crossings, downed trees, and faint trail that may be hard to follow. Overall, we were happy to find either mostly clear trail or mild versions of the conditions I mentioned and our pacing was unaffected. On the Appalachian Trail, there is a shelter seemingly every 10mi or less. Even if you don’t camp in them, they can make meals and bathroom stops on a rainy day more enjoyable. 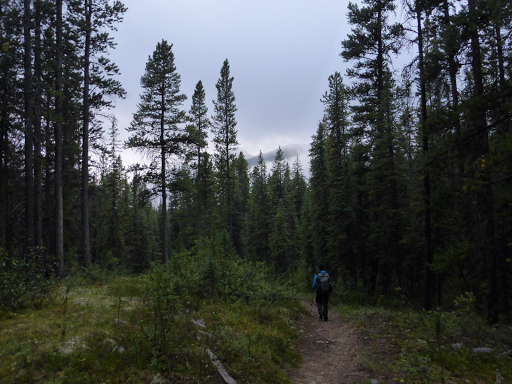 Since we’re in Jasper, there are campsites fairly often and it made us think of the AT. Today, we passed three by lunch. The second one we came to, Avalanche was where we took our morning breakfast break. It was still gloomy and cool out with rain at times, but we were in a spot where we had a table and could be sheltered by trees. One couple was there, and coincidentally, the guy lived and worked where I went to college at the Univ of Illinois in Champaign, IL. Small world! It was fun to talk to them. 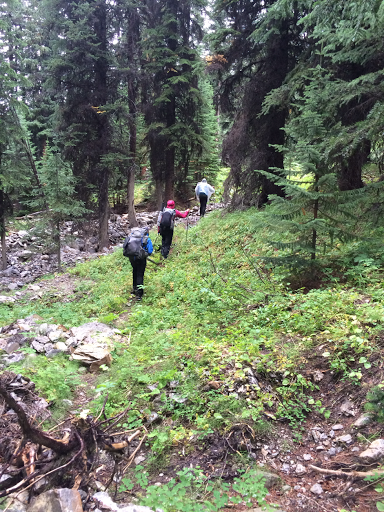 As we set off, the light rain kicked back in, now above tree line. 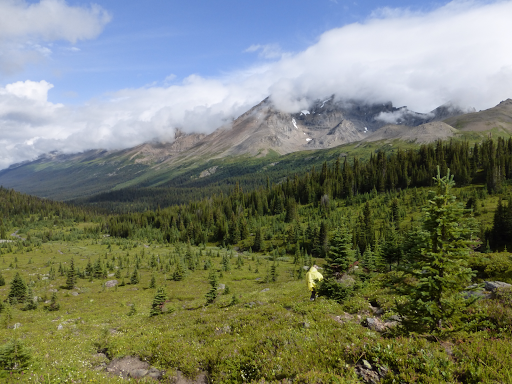 We had a gradual climb up to Maligne Pass and it was more scenic and significant than we anticipated. It was pretty brisk out with a steady wind, but at least the rain held off for awhile. The sun attempted to come out and never really won for an extended period all day. To our left was the Endless Chain Ridge and on the right was the Queen Elizabeth Range. We hit yet another campground at lunch and had lunch there. We had hoped the sun would come out to dry things and settled for temporary moments of sunlight and warmth. We only had 8mi/13km to go after lunch and took our time at lunch. As we packed up, light rain showers returned and Gian and Laura arrived. They weren’t sure how far they’d go today depending on how the weather and terrain went, and we ended up hiking the rest of the day together and camping together again. Our little hiker bubble we’ve developed and it’s fun to have other hikers to leap frog with. The afternoon was filled with more rain and mostly forested hiking. It was similar to the AT because it was fairly rooty, rocky, mossy, and buggy. 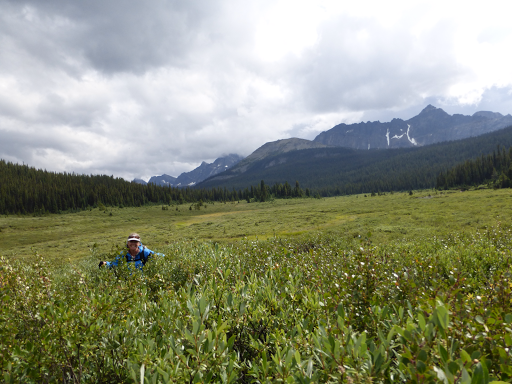 The final stretch of the day was in a very overgrown area along the Maligne River. It was a walk of shoulder high brush in some stretches and I was just glad it was fairly dry. We made it to Mary Schaffer Campground by 4:30pm. The mosquitoes are swarming and E and I put on repellant for the first time this trip. 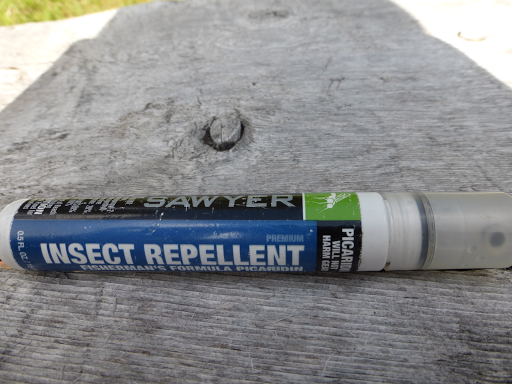 I have the Sawyer bug repellant spray and it worked like a charm. I always feel bad giving into the mosquitoes and it was nice to put on something that isn’t deet and doesn’t harm gear or clothing. I also like the compact size of the little spray bottle. I know they have a variety of versions of spray and even a lotion version that’s supposed to work great. Well done Sawyer! I haven’t slept well the last two nights (probably due to rain) and retired early around 7pm. I get especially tired when I’m cold and wet all day, and today was a fairly wet and cool day. I tried to blog and fell asleep for an hour. I woke up around 8:30pm and did the rest then. I’m in a nice little pine needled spot and the others are nearby in a grassier area. 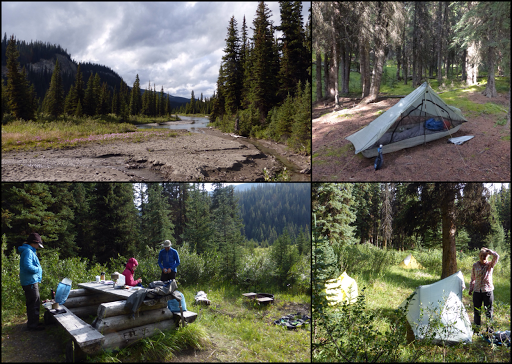 Although this camp seems rarely used, it still has a nice area to eat, toilet, and bear hang cables. Overall, we’ve found Jasper camping to be much more relaxed than we expected for a national park. Similar to when I did the Hayduke and went through the Grand Canyon, we’ve gotten the impression that few hike in this stretch and that we can kinda adjust our sites as we go if needed since we are thru hiking. We’ve hardly seen anyone out here. The next couple nights, we will hit more destined areas, but even in those spots, it seems that people just kinda show up oftentimes and camp without a permit. Four Corners campsite, when I hiked through yesterday morning for example, was packed and I’m sure most were just squeezing in without a permit. People seem to understand this and Canadians are so chill about it. Kinda an unsaid thing it seems. It will be interesting to see if it is the same now that we are hitting more destined campsites along the popular Skyline trail the next couple of days. 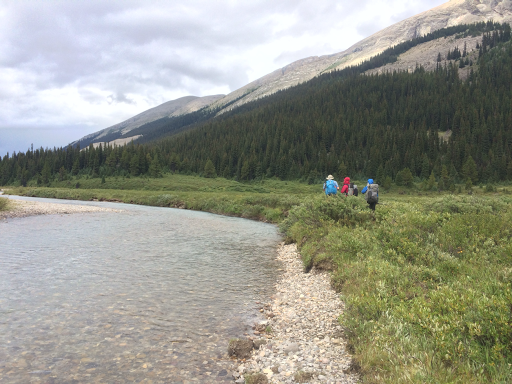 We plan to camp at out permitted spots through there, but I can say that in all our hiking through all these national and provincial parks, we’ve yet to run into any rangers of any sort. 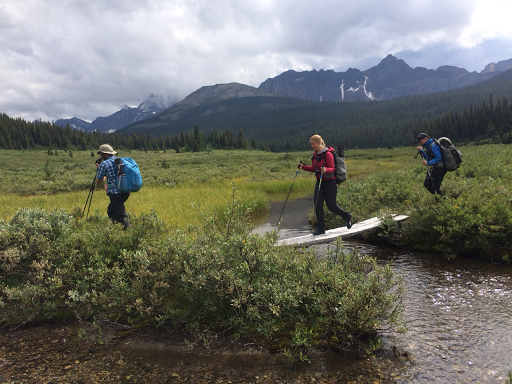 We have lined things up perfectly to hit the Maligne Lodge around lunch tomorrow and relax there for the afternoon before hiking on. Bonus food and lounging! Speaking of which, I now have a second wind after my evening nap and am going to watch a bit of OITNB before bed, yay!